WAND Legal Taxonomy - Updated! As we have said before, laws are complicated. They are also necessary. So are the courts, law firms, and corporate legal departments that interpret those laws. The work that they do also generates documents - a lot of documents - and that's where the WAND Legal Taxonomy comes in. The top-level terms in the WAND Legal Taxonomy are Contracts, Courts, Law Firm Management, Legal Practice Areas, and Litigation. In our latest review, we've also added Sources of Law. In Contracts, Contract Parties has been expanded as has many areas of Bankruptcy in Legal Practice Areas. In Litigation, terms have been added to Courtroom Participants and Punishments. We have also added a list of Crimes in Criminal Law. All areas of the taxonomy had additions made to both the terms and the synonyms. The taxonomy now has 3,631 terms and 1,868 synonyms. We recently released our latest addition to our taxonomy library - the WAND Lumber Manufacturing and Forestry Management Taxonomy! This taxonomy provides a foundation of 1,490 terms and 1,051 synonyms that can be customized to include specific terms to meet the document management needs of any lumber manufacturer. Beginning with the growth and harvesting of trees in Forest Management, the taxonomy goes on to include terms specific to the types of trees harvested in Raw Materials. On the manufacturing side, the top level terms are Lumber, Manufacturing, Lumber Manufacturing Facilities, Wood Characteristics, Damage, Lumber Grading, Distribution, and Storage. 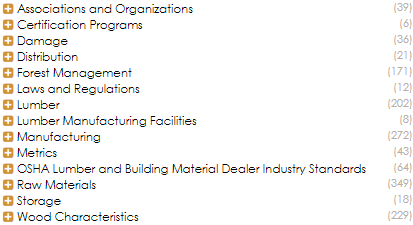 The taxonomy also includes Associations and Organizations, Metrics, OSHA Lumber and Building Material Dealer Industry Standards, Laws and Regulations, and Certification Programs. 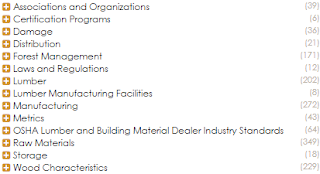 The WAND Lumber Manufacturing and Forestry Taxonomy provides a strong foundation for any enterprise that engages in timber extraction and replanting, lumber manufacturing, or both. The WAND Lumber Manufacturing and Forestry Management Taxonomy complements several taxonomies including the WAND Building and Construction Taxonomy, the WAND Manufacturing Taxonomy, and the WAND Environmental Taxonomy. As with all WAND Taxonomies, the WAND Lumber Manufacturing and Forestry Taxonomy is available by itself or as part of the WAND Taxonomy Library Portal.